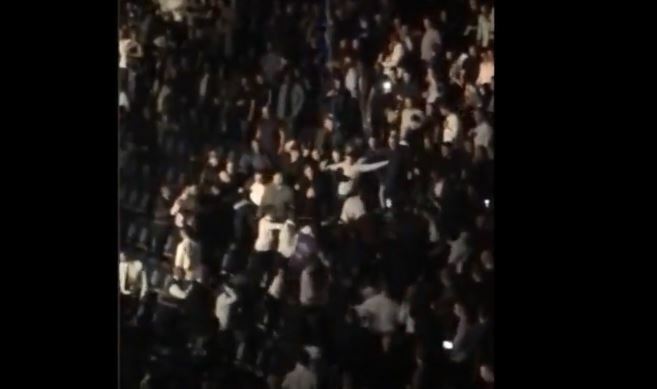 A boxing brawl last night broke out in London following a professional bout between George Groves and Jamie Fox. The fight took place at the Wembley Arena in London (near Wembley stadium) in a bout that local London man Groves ultimately won by stoppage in the fourth round. Unfortunately the fighting was not only done inside the ring however, as footage that has emerged shows following the bout. The atmosphere was understood to be lively but friendly for the start of the night but as things transpired and inevitably more alcohol was taken on board, things took a turn for the unexpected. Unfortunate scenes indeed. Scenes that sometimes happen not just in boxing but at any sporting or entertainment event. Security seemed to control the situation in a relatively quick manner inside a few minutes before things went any further. Inside the ring Groves finished the show in clinical fashion with a fourth round body shot. Straight after the fight his next opponent Chris Eubank Jr who was ringside on the night – was already been called out by Groves.